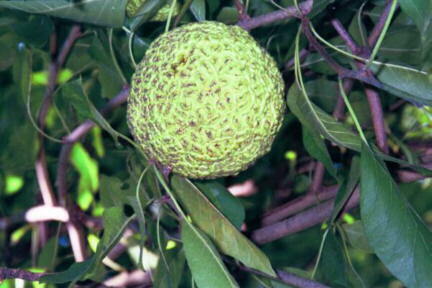 Perhaps the best known species named in honor of William Maclure is the one commonly called "Osage orange" or "horse apple" - of course, these terms apply to both the fruit and the tree - the tree itself is also called "bois d'arc," a name consonant with the use of the wood by Indians for making bows. Of all the specimens of Maclura pomifera in the world, the tree whose fruit you see here is probably the closest to the historic house in which Maclure lived while in New Harmony. The tree stands just behind Paul Tillich Park, about two blocks from the Maclure house. Although the earliest mention of the species dates from 1804, Rafinesque first described it "officially" in 1817, assigning to it the genus-name Oxyton and species name pomifera; later he corrected what was probably a typographical error to Toxylon. However, Maclure's colleague Thomas Nuttall gave the genus-name Maclura. This upset Rafinesque, but the name Maclura stuck.